Avital, Tamer and Samar are all 12-year-old children from Jerusalem. One is a Jew, another is a Christian, the third a Muslim. But when they play together, it’s hard to see them as anything but children. If they were growing up in a different world — one without political disputes, military checkpoints and a pervasive climate of hatred, suspicion and fear — their friendships would undoubtedly thrive. For 10 days this summer, that “different world” became their reality. Recently, Avital, Tamer and Samar were among the 36 children — 12 Palestinians, 12 Israelis and 12 Americans — who participated in an interfaith educational program called Kids4Peace. 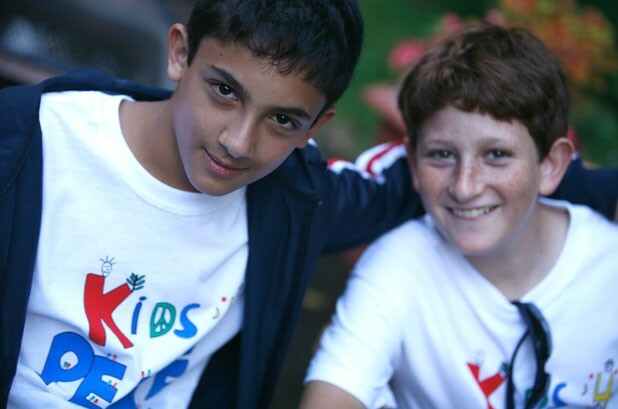 Each summer, Kids4Peace tries to plants the seeds of long-term peace for the next generation of Middle Easterners and Americans by focusing on the spiritual commonalities within Judaism, Islam and Christianity. The program is jointly sponsored by the Episcopal Diocese of Vermont, Ohavi Zedek Synagogue and the Islamic Society of Vermont. Burlington’s Rock Point School hosted the kids. Kids4Peace is the brainchild of Dr. Henry Ralph Carse, a native Vermonter who has been splitting his time between Vermont and the Middle East for the last 39 years. A self-described “practical theologian,” Carse leads interfaith pilgrimages to holy sites throughout Israel and Palestine. He launched Kids4Peace in 2001 as a response to the Second Intifada, or Palestinian uprising, which took an especially heavy toll on the region’s children. Carse’s initial goal was simple: to get Israeli and Palestinian children out of harm’s way. He soon realized that by physically removing kids from the conflict zone, he could also remove the political, cultural and ideological boundaries that separate them. The problem, Carse explains, is that for several generations, all the proposals advanced for effecting peace in the Middle East have been based on political solutions. But as each one has failed to deliver on its promise for enduring peace, people on both sides of the conflict have been left feeling disappointed and betrayed. Carse’s idea is that, embedded within the Jewish, Muslim and Christian traditions are “peace tools” that have never been fully explored or utilized in addressing the Arab-Israeli conflict. Illustrating Carse’s point, three dozen children sat in a circle inside Bishop Hopkins Hall singing “Salaam Shalom,” a song named for the Arabic and Hebrew words for peace, respectively. Some of the kids spoke mostly Arabic, others mostly Hebrew, and nearly all knew at least some English, the program’s common language. Before them on a coffee table was an assortment of religious objects — a yarmulke, Muslim prayer beads, a Christian incense burner. They’d just completed a daily ritual called “the sharing of sacred objects,” wherein one child selects an object from the table that he or she wants to know more about. Then, someone from that religion explains the object’s meaning. Josh Thomas, a Kids4Peace worker on loan from the organization’s Atlanta chapter — Kids4Peace also has chapters in North Carolina, Canada and Jerusalem — weighed in on the significance of this game of show-and-tell. As Thomas explained, many of the Israeli and Palestinian children have never entered a house of worship other than their own, or broken bread with someone from a different culture or religion. Just as likely, they’ve never encountered someone from the other side of the conflict who’s not a soldier, police officer or politician. The only tense moment came shortly after my introduction to the group — in English, followed by Hebrew and Arabic translations. Zoubaida, the group’s Jerusalem coordinator, pulled aside her American counterparts and held a hushed but emotional discussion out of my earshot. Rev. Diane Nancekivell, who chairs the Kids4Peace Vermont board, later explained the nature of Zoubaida’s dismay: Apparently, no one from the American group had informed her that a journalist would be visiting that day. However, this minor faux pas was quickly resolved after we agreed to a few simple security protocols, such as not printing the last names or hometowns of the children or their guides. For their part, the children seemed unfazed by a reporter’s presence. Despite expressing a few initial trepidations about traveling to a different country and living with people who didn’t speak their language, they seemed either to forget or overlook their obvious differences. There was no sign of nervousness as the kids rehearsed for that evening’s activity, a performance called “Abraham’s Tent.” As an “ensemble,” they were a squealing mob discovering the playground potential of a bunch of beanbag chairs. And, despite the range of skin color, from white to deep olive, it was difficult to tell Jew from Christian from Muslim. That said, Kids4Peace’s Thomas is working on a PhD dissertation at Emory University that explores the longer-term consequences of children’s participation in this program. Although his research is still underway, Thomas has found that many Kids4Peace alumni in their late teens are now active in other international programs and peace-related activities. As for their American counterparts, Thomas has also heard anecdotes of kids participating in tolerance education programs and, less formally, of kids standing up for minorities within their own communities, such as defending Muslim kids who were being picked on by fellow students. Later that evening, the kids performed “Abraham’s Tent” on the shores of Lake Champlain. As Abraham is considered a patriarch of all three religions, the children were divided into three groups — each with an equal mix of Jews, Muslims and Christians — and performed skits highlighting one ritual or tradition from that particular faith. Seated outside the Bishop Booth Conference Center on a buggy but pleasant evening, the audience of some 80 parents and community members watched the children reenact the Muslim story of God ordering Abraham to sacrifice up his son, Ishmael; the Christian celebration of holy week; and the Jewish story of God coming to Jacob in a dream. It played out like any school recital, with plenty of cheat sheets and giggles. Although such solidarity may seem like a big deal to adults, for the American, Palestinian and Israeli kids, it was just something fun to do.